For being a rather innocuous juicy, round ball of goodness, the tomato is surrounded by opposites and filled with powerful nutrition! Gershwin added to the confusion with his famous, “You say ‘tomayto’, I say ‘tomahto’ …” Then there is the continued argument as to whether it is a fruit or a vegetable. Throw in that it’s part of the nightshade family, and we can all wonder as to the details of this succulent, little thing. Let’s start with the simple. It is a fruit. The tomato grows from the ovary in the bottom of a flower and contains seeds. These two, little facts give it the scientific classification of fruit. As for being a nightshade, so are white potatoes, eggplant and all peppers. If you don’t have a problem with these foods, then it really doesn’t matter. Now as to the pronunciation, we say stick with whatever rolls off your tongue first. Either way you say it, the flavor and amazing health benefits will stay the same! Did you know there are over 3,000 varieties of tomatoes? If you don’t like one type, there are plenty more to try, each with varied looks, flavors and textures. As for their vitamin, mineral and antioxidant content, they are all really good for you, but four, the New Girl, Jet Star, Fantastic, and First Lady, have been shown to have slightly higher antioxidant levels, though not enough to exclude the rest from your grocery list. They also pack a punch in vitamin C, vitamin K, potassium, copper and manganese.A well-known nutrition fact for tomatoes is their high level of lycopene. Something you may not know is that tomatoes are filled with lycopene no matter what color they are! It is most often associated with the bright reds of fruits and vegetables, but in this power fruit, the heavy antioxidant flows in all varieties. We could write about the miraculous power of lycopene all day long, but here’s the short and sweet of it. Lycopene is one of the more effective antioxidants that we can put in our body, which means it is better at fighting free radicals in order to help protect our cell membranes, in turn keeping our cells healthy so they can prevent major diseases. By major diseases, we’re talking cancer, heart disease, diabetes, age-related macular degeneration and cataracts. Another awesome benefit of tomatoes is the fact that they can help lower cholesterol! That lycopene we were talking about helps stop LDL from turning into artery clogging plaque. Lycopene also fortifies bones and helps reduce the risk of osteoporosis. Here’s a fun tidbit: lycopene is also a natural sunblock and protects your skin from the inside! A lesser known study are the many phytonutrients in tomatoes. Suffice it to say, tomatoes have several, and they all protect the heart!It's obvious tomatoes love your body. Now it’s time for you to love tomatoes! 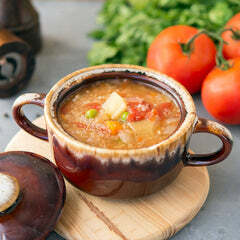 Please your heart and your health with tomato based sauces, salsas, soups, garnishes, toppings and snacks. 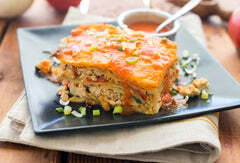 Let Veestro please your taste buds with our Veggie Lasagna or the Thai Chick’n Stew! This is one casual fruit with serious benefits.